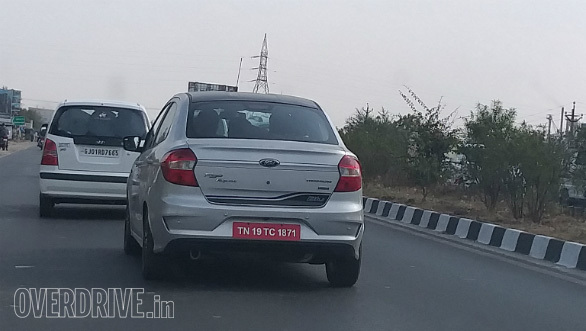 An unannounced ‘Ford Aspire Blu’ was spotted testing on the outskirts of Ahmedabad recently, courtesy Overdrive. 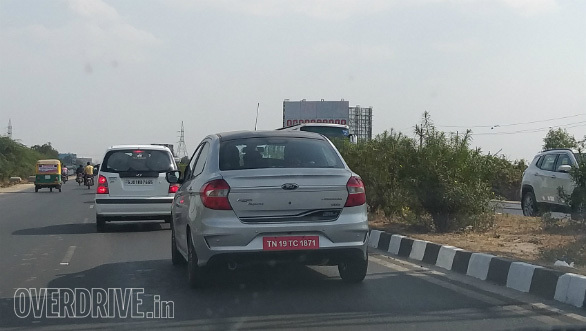 In December last year, spy shots of a Ford Figo Blu had popped up online. ‘Blu’ suffix is expected to be for the petrol-CNG variants, but Overdrive's report suggests that it's for a special edition model. ‘Blu’ suffix is expected to be for the petrol-CNG variants of Ford vehicles. Overdrive, on the other hand, says that the test mule seen here is fitted with the 1.5-litre TDCi diesel engine and that the company will offer the 1.2-litre Ti-VCT petrol engine as well. The test mule has a gloss black roof, blacked ORVMs, 15-inch black alloy wheels and gloss black inserts with chrome accents, it points out, suggesting that the Blu variant is basically a replacement for the discontinued S variant that was launched in April 2017. There’s no word on the launch timeline of the Blu variant of the Ford Figo and Ford Aspire at the moment. In the immediate future, the facelifted Figo and the facelifted Endeavour are the only expected launches from the Blue Oval. The latter is said to reach showrooms on the 22nd of this month, while the former should go on sale next month. The regular Ford Aspire is available with a 1.2-litre Ti-VCT three-cylinder petrol engine (96 PS/120 Nm), a 1.5-litre Ti-VCT three-cylinder petrol engine (123 PS/150 Nm) and a 1.5-litre TDCi four-cylinder diesel engine (100 PS/215 Nm). The 1.2-litre petrol and 1.5-litre diesel engines are paired with a 5-speed manual transmission, while the 1.5-litre petrol engine channels power to the wheels via a 6-speed automatic transmission. The regular Ford Aspire is available with a 1.2-litre Ti-VCT three-cylinder petrol engine, a 1.5-litre Ti-VCT three-cylinder petrol engine and a 1.5-litre TDCi four-cylinder diesel engine. Ford doesn’t plan to launch an all-new model in India this year. Its next major launch is a C-SUV co-developed with Mahindra, but that model is probably a year or two away from its commercial release.